The Piccadilly Valley welcomed the Croser family back into the Tapanappa Winery with a typical cool weather vintage of exemplary quality. The winter provided average rainfall and replenished the subsoil but from August to December very dry conditions prevailed, the Piccadilly Valley receiving just 40% of normal rain. The three spring months and December were much warmer than average, only exceeded by the temperatures preceding vintage 2016 and vintage 2010. The warm dry conditions led to an early and perfect flowering and fruit-set in all Piccadilly Valley Chardonnay and a balanced crop of 8 tonnes/hectare. After December, the ripening months were cooler than average by about the same amount as the first three months were above average. Hence the 2015, seven month vintage heat summation coincided with the long-term average of 1173 C days. A January rain event relieved developing stress in the vines. Despite being an average cool vintage the Piccadilly Valley Chardonnay ripened two weeks earlier than normal in mid March. The early harvest was determined by the very warm spring and early bud burst and flowering. Hand harvested Piccadilly Valley Chardonnay grapes were destemmed, crushed and chilled to the new Willmes Merlin airbag press. The 2C free-run juice combined with the light pressings was settled briefly then racked and gravitated to French Vosges oak barriques (33% new) for a cool autumn air fermentation. As soon as the fermentation was finished the barriques were topped and the wine was left to mature on full yeast lees. In the summer the wine was clear racked off lees in preparation for bottling in mid March 2016. 2013 Tapanappa Piccadilly Valley Chardonnay is the product of a warm and dry vintage. The flavours are of fully ripe Piccadilly Valley Chardonnay, all peaches and melon and the significant natural acid is poised against these ripe flavours. 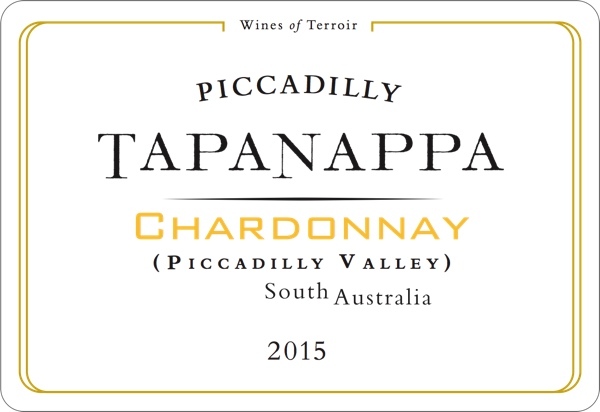 The Tapanappa 2015 Piccadilly Valley Chardonnay has significant flavour with the savoury structure and stone-fruit freshness reflecting the unique cool climate terroir of the Piccadilly Valley in a superior vintage. Bottled in March 2016. Only 330 dozen grown and made.